Jeremy Corbyn has become embroiled in a furious row with Virgin Trains over claims of overcrowding and his agenda for rail nationalisation after he recorded a video on a service he took to Newcastle ahead of a leadership hustings. Hours before the debate with Owen Smith on August 11, Corbyn released a video from his journey to the North East, showing him sat on the floor of a train which he described as “ram-packed”, while he made the case for public ownership of the railways. The journey was on an East Coast Mainline service from Kings Cross – a franchise that went from public ownership to Virgin Trains last year. 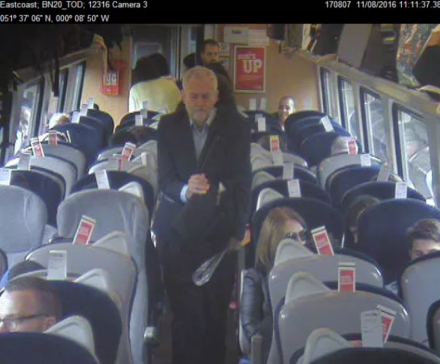 Virgin Trains has today hit back at Corbyn’s version of events – releasing CCTV footage which apparently shows the Labour leader walking past empty, unreserved seats before filming his video. There is also a shot of him sitting in a seat following the recording of the video, but before the train made its first stop in York. 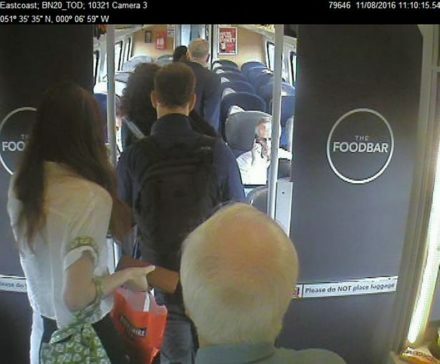 A spokesperson for Virgin Trains said: “CCTV footage taken from the train on August 11 shows Mr Corbyn and his team walked past empty, unreserved seats in coach H before walking through the rest of the train to the far end, where his team sat on the floor and started filming. Corbyn’s line appears to be corroborated by other passengers to some extent, with one who posed for a photo with the Labour leader tweeting that he only got a seat once rail staff started “shuffling” people around. In his video, Corbyn praises the “absolutely brilliant” staff on the train.